Mon-AM: 1:01, 2500' ~ 2nd Flatiron+Green Mt. Up 2nd down 1st Saddle. Nice mellow morning outing, but hot. From Chautauqua. Got out for a mellow hike in the evening. Finished just as it was getting dark. From the Maroon Lake parking lot. 1:25 up, :58 down. The last 1000' is an exposed 4th Class chosspile of a ridge that took me 22min to navigate on the way up and 20min on the way down. That should attest to its techiness and generally shittiness. Still, the Elks have to be in the running for most scenic mountain range in the state. 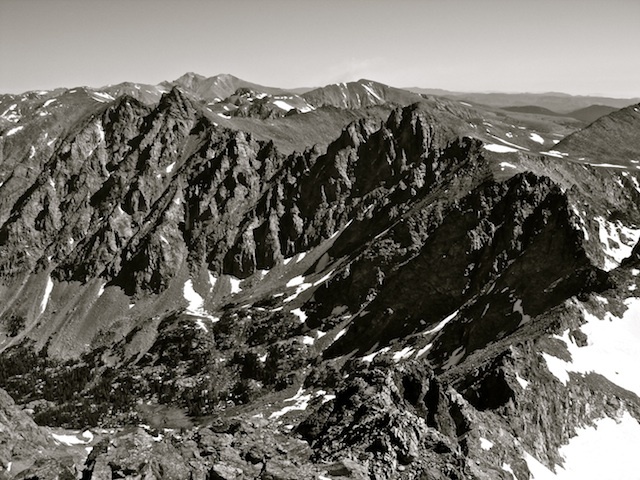 Wed-AM: 2:07, 4500' ~ Torreys (14,267') and Grays (14,270') Peaks via Kelso Ridge. Parked 1.5mi from the trailhead. Fighting a bit of a cold, so didn't have a ton of pep, but legs felt solid on the ridge and the time between summits was only 13:30. Cloudy, gloomy morning in Boulder, but I enjoyed brilliant sun up high. 1:39 for the run trailhead-to-trailhead. Really good morning. Car-to-car (up Ellingwood, down NW Ridge from Highway 82) I managed a 2:57:46 with a 2:21:33 ascent and a 35:46 descent after ~30sec hitting a gel on the summit. Perfect weather. Could see shaving a few minutes off this now that I have some familiarity w/ the routefinding on the ridge. Up and down from Echo Canyon. 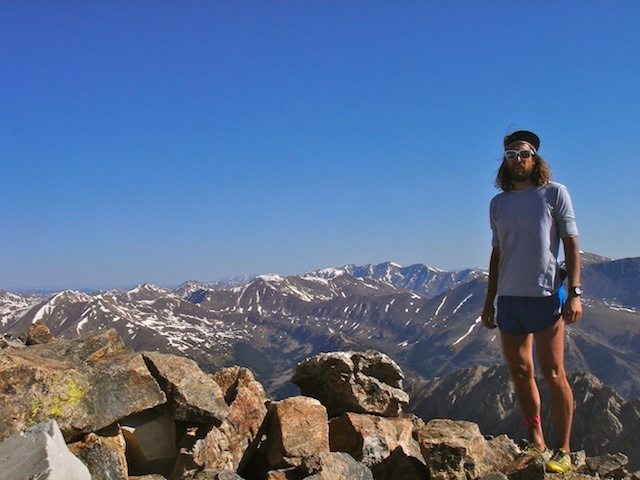 I was crewing Joe for his run over Massive, Elbert, and La Plata, so after parking on Highway 82 I ran up to the summit, waited for him there, and then showed him the line back down. Tired legs today, yesterday took a bit more out of me than I thought. Long, techy route, too. Really fun descent below Golden Fleece Mine, though. 1:30 up/:52 down. From the South Cottonwood TH on the CT, over to Maxwell Gulch, then up the gulch to the NE ridge to the summit. Back the same way. With Joe (though he turned around at the ridge w/ tired legs). More Nolan's scouting. Took 48min to run the CT over to Maxwell Creek after which 15min of heinous bushwhacking occurred, heading up the gulch. Finally emerged from the jungle, gained the ridge and grunted to the summit. Took 1:19 to do the 4500' of vert from the CT to the summit. On the way down, I slalomed down a particularly nasty scree/talus chute, cut across to the south side of the gulch above treeline, and gained the actually quite nice abandoned road/trail that offers a remarkably clear path back down to the CT (48min descent). Took another 30min to run the CT back to the Roost at South Cottonwood. Before finding the abandoned trail on the way down, I was convinced this climb is the crux of Nolan's...it's still a giant vertical mile of gain, but much smoother now that I know the line. Very important, as I almost certainly will be doing Princeton at night. Up Kieners, down Keyhole+Reveley Route. Improved my car-to-car time by a couple minutes: 2:26:11 RT = 1:34:54 up/51:17 down. With the hot, calm weather I decided to just go in shoes and shorts--didn't take a jacket this time--and carried a pair of tent stakes again for the traverse of Lambs Slide. I was right on my splits from last week until treeline (legs were a bit heavy again, coming off the run up Princeton yesterday), and then I gained a few minutes between treeline and the base of Lambs Slide (no wind to deal with this time, so I could actually run most of it). My climb up the east ridge of Lambs Slide was sort of hairy this time, as for some reason I ventured into high 4th Class terrain with even some 5th Class moves. I was just stubborn about not losing elevation I guess. The snow traverse was easy as the snow was very soft and I basically didn't even need the stakes. I also traversed way lower than last week, which saved a ton of time. Above Broadway I'm getting the route pretty dialed in, so that went quickly and soon enough I was on the summit, with a nearly 7min PR. Since I'm not yet comfortable downclimbing the wet North Face, though, after literally 5 seconds of catching my breath I descended the Keyhole route, passing a bunch of people on the Narrows and moving quite well down a completely dry Trough. After the Boulder Field outhouse I cut across for the ridge and took my now usual descent down to Jim Grove and back to the TH, running pretty much as hard as I could because I needed to get back to Boulder for an appointment. Bottom of Trough - 1:44:?? With the dry Trough conditions, I think I may take a crack at the true standard Keyhole route up and down FKT sometime in the next week or so. Something in the 2:30-40 range seems possible (1:35-40 up, 55-60min down). It looks like that with a descent of the North Face instead of the Keyhole, I could come close to cracking 2:20 on the roundtrip of Kieners. This was a nice comeback week for the shin after having a bit of a scare the previous week and realizing that it isn't ready for the really long days yet. I'm more than happy with the way it held up this week, though, and am grateful for every summit and day in the mountains. Speedgoat will probably be my first race back. 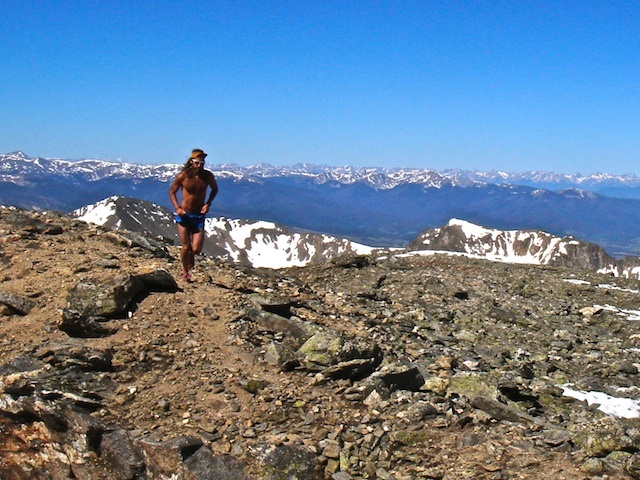 I haven't decided yet if my shin will be up for all the running at Leadville (less than 4mi of that race is worth hiking if you're going as fast as I like to), but I'm just excited to get back to some competition. Of course, yesterday's WS100 can't be ignored. I think we all knew that heat has an adverse effect on distance running performance, but wow, quite a spectacle that everyone out in California put on yesterday. Really inspiring stuff from lots of people; it's awesome to see the sport continue to move forward. I'm extremely excited to get back amongst it, that's for sure. La Plata summit, Monday evening. 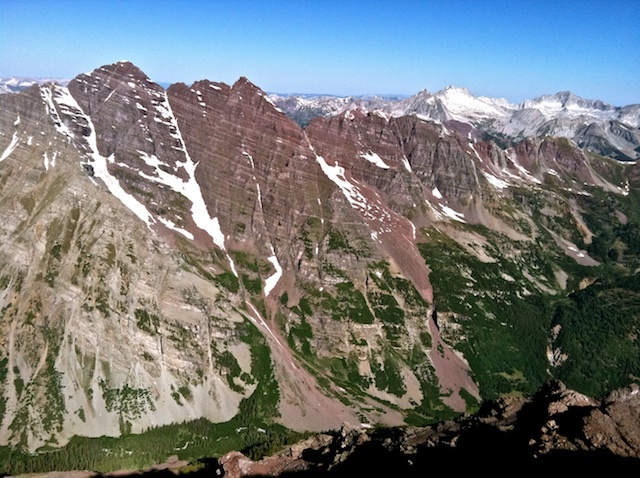 Maroon Bells and Snowmass from the summit of Pyramid Peak. Pretty much only been listening to The Walkmen's new album for the past month. Last week was a fun experience. I was back spending a few days in Boulder, supporting Scott's book tour, seeing friends, etc. 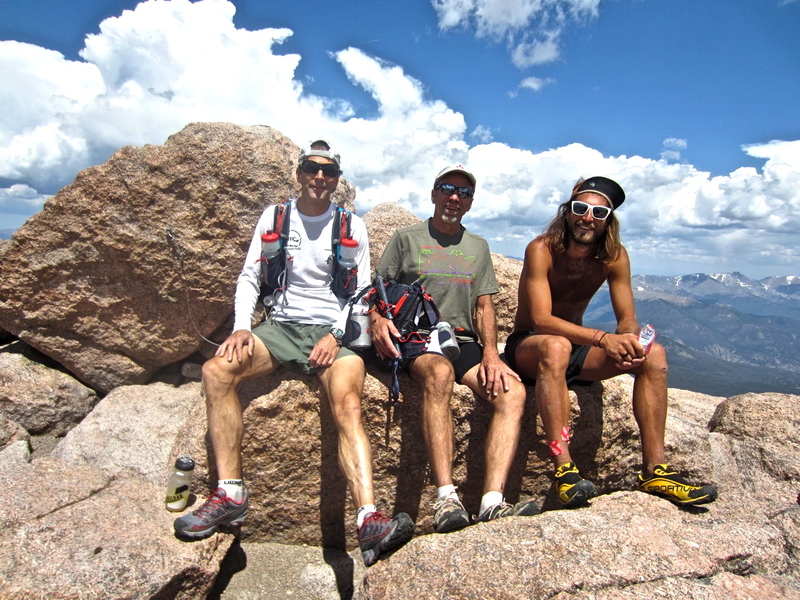 Part of this involved getting out on Kieners on Longs Peak with Buzz and Peter. 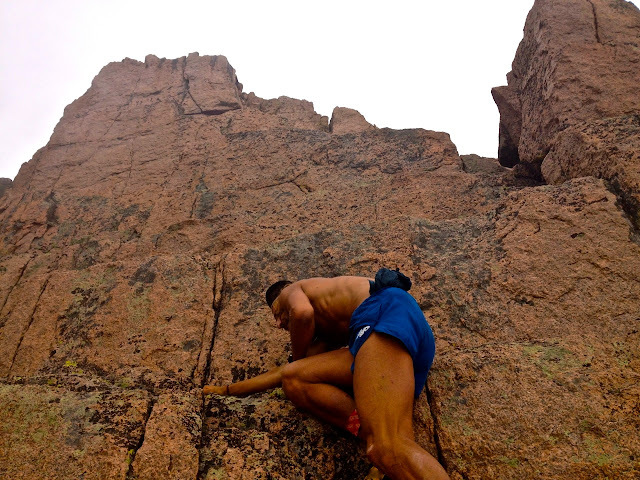 Last fall, when my shin injury gave me time to rekindle my interest in technical rock climbing, Buzz started taking me out on the Flatirons for some scrambling--soloing on moderate terrain. After a few times up the uber-classic Third Flatiron, Buzz commented that we would do Kieners in the summer. So, last Friday we did. I'm working closely with Buzz and Peter (and Scott) on developing a series of new packs with Ultimate Direction, and one of them is dubbed the "Adventure Vest". Kieners would be a perfect line for testing the performance of this kind of pack. 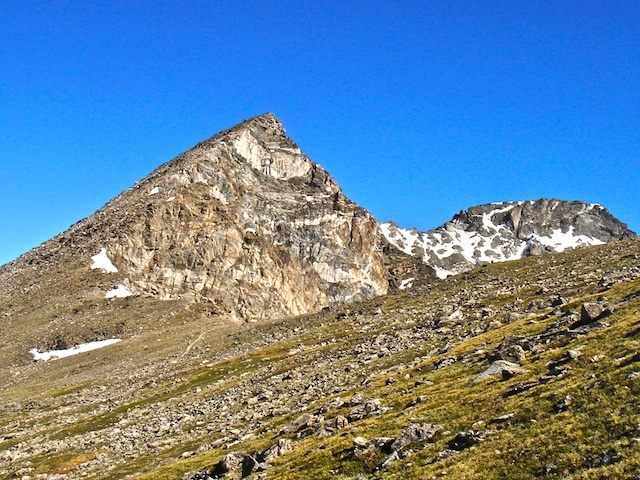 Kieners is a classic mountaineering route on an even more classic mountain. 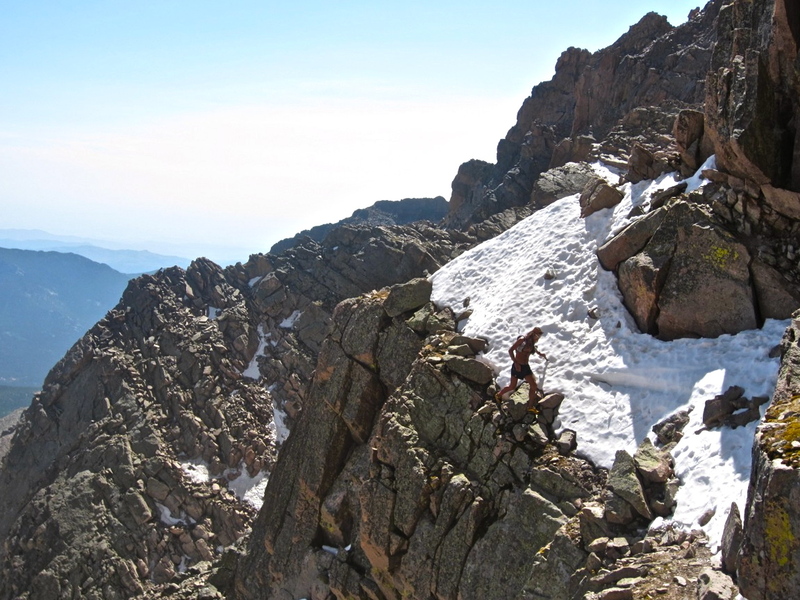 "Mountaineering" meaning that it isn't just a simple walk up a Class 2 trail, like most standard routes on 14ers around the state. 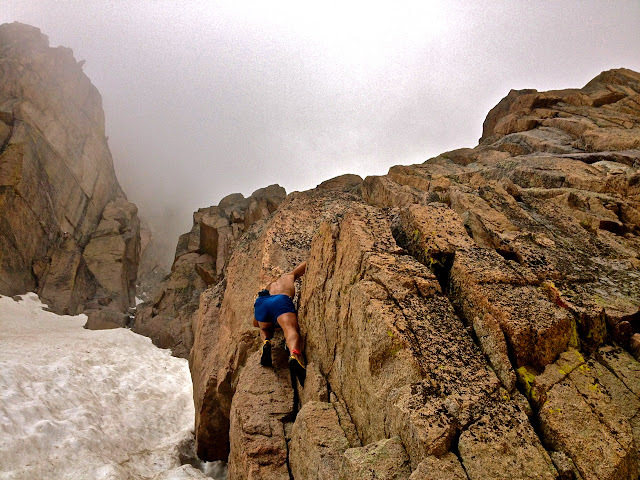 Instead, K offers a spicy and engaging mix of standard trail; talus and boulder hopping; the ascent of an almost 1000', 50 degree snow field; and then Class 4 & 5 scrambling along the edge of the Diamond before summiting and descending the 5th Class North Face. 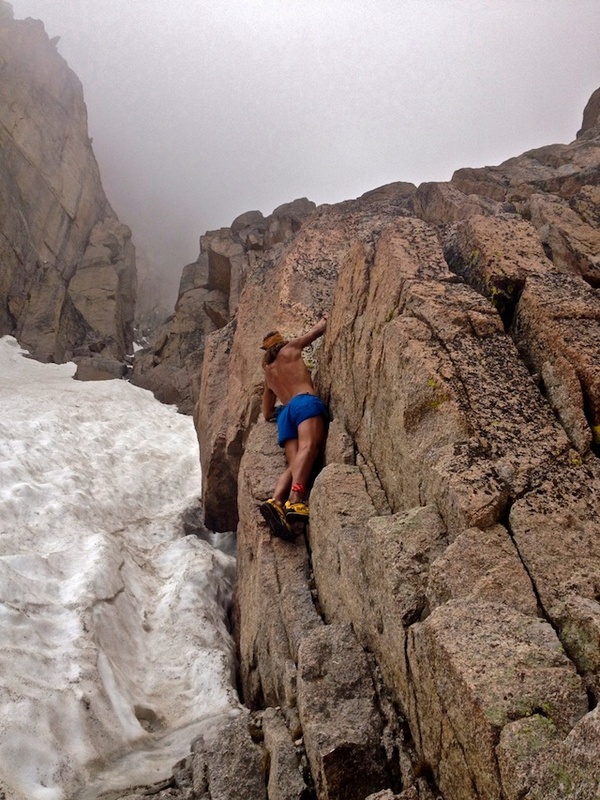 Kieners' consensus grade is 5.4, due mostly to some moderate crack-like climbing after the Broadway traverse. It can be a fairly long day (I think we were out for around 6hr on Friday) in an exposed and prone-to-quick-changes true alpine environment, so usually it's necessary to carry food, water, and an extra layer or two along with an ice axe, crampons, and--because our planned slabs descent on the North Face was still soaked with meltwater--a rope for rappelling. 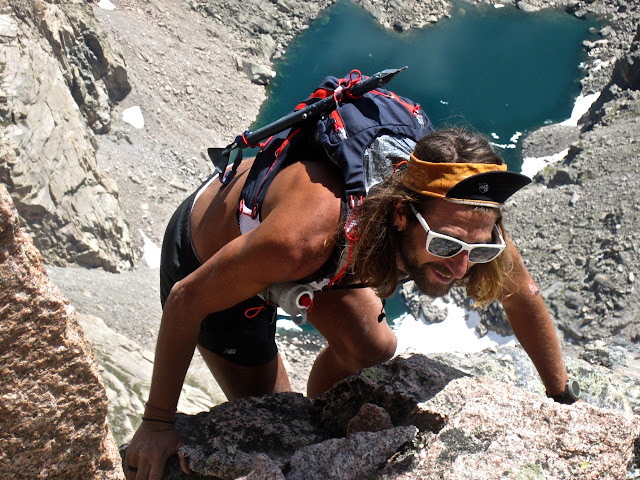 As such, the packs would be tested doing exactly what they've been designed to do--mix running with mountaineering, or just carry a slightly larger-than-normal load. Buzz's post re-capping the day is here, but from my perspective it was simply a joy to be with such experienced friends in such an exhilarating landscape. So much so, that as we were negotiating the moves that Buzz and Peter deemed the crux, I pronounced that I was going to come back the next day and hit it all again. The line is that good. Peter works his way up Lambs Slide. Photo: Buzz Burrell. Traversing Broadway. Photo: Buzz Burrell. 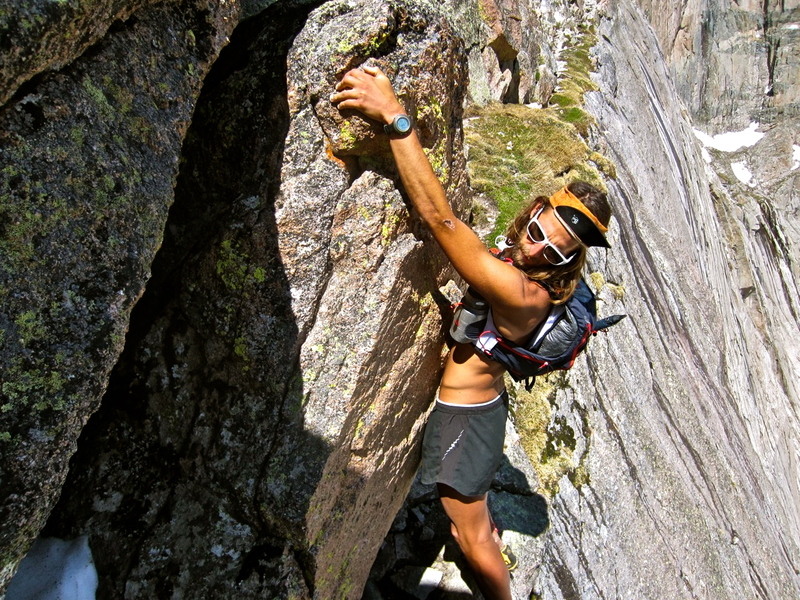 The crux move on Broadway. Photo: Buzz Burrell. Climbing onto the Diamond Step, ~200' below the summit, with Chasm Lake almost 2000' below. Photo: Buzz Burrell. Happy to share the summit with a pair of pioneers. Photo: Buzz Burrell. So, I did, along with my oft-partner-in-crime for such alpine adventures, Joe Grant. At the last second, Joe decided to bring his Go Pro Hero headcam for pics and video, which turned out to be a good idea; he got some good stuff, per usual. 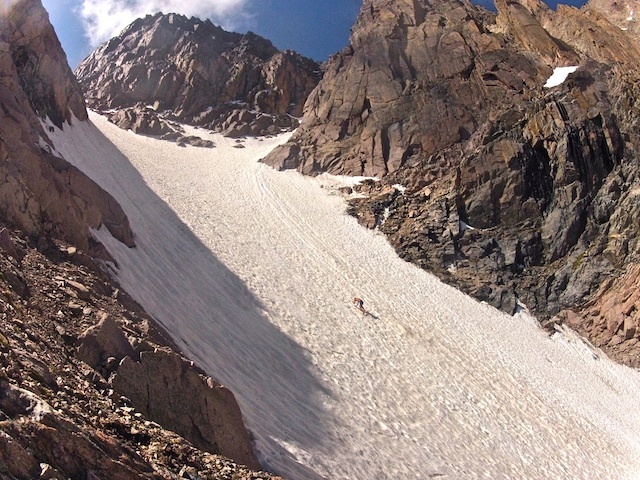 On this particular outing--inspired by Buzz's stories about leaving behind the hardware and just scrambling the 3rd-4th Class ridge next to the Lambs Slide couloir instead of heading up the snow--we tried that ourselves and it worked out great. There was a lot of stop and go on the day as there often is during a tandem adventure, and especially because of the digital documentation that Joe was performing. However, I clocked my moving time from East trailhead to trailhead at only 2:38, so knew immediately that I would have to come back very soon to give it an honest, non-stop, FKT-style effort. Why not the very next day? A critical piece of beta that we'd taken advantage of the previous two days was that a climber working a project on the Diamond had fixed a rope on the North Face descent slabs. This little fact meant that, even in the current water-slick conditions, I could do the route in nothing more than a pair of shorts and sticky shoes (with climbing rubber) and carrying only a 3oz shell (always a good idea in an alpine environment, even if you don't use it), one gel, and a pair of tent-pegs for crossing the snow-filled couloir. A unique opportunity, indeed (at least until the Cables slabs dry out later this summer and I can just downclimb them). Here is a quick synopsis of my day out looking to set an FKT, that I posted to the Satan's Minions listserv. 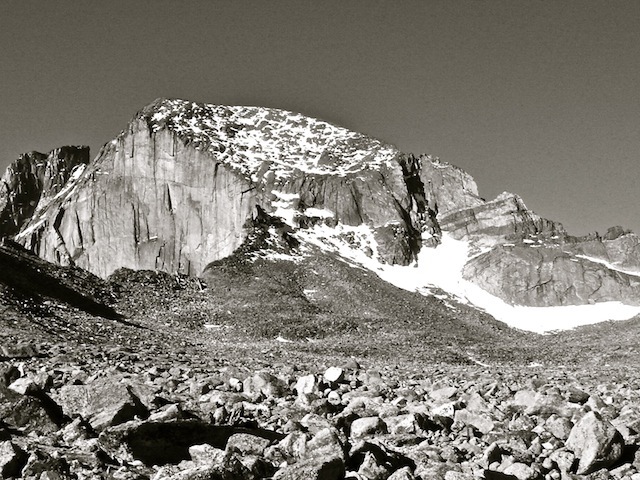 Just got back from Longs Peak (for the third day in a row :). Worst conditions of the four times I've been up there, with crazy winds between treeline and Chasm Lake. Today was a concerted see-how-fast-I-can-go effort on the up, but, unfortunately, my climbing legs were way flat today and then the wind above treeline was extremely discouraging/slowing. At any rate, going up Kieners and down the Cables and taking every short-cut I know of, I went 2:28:31 car-to-car with a 1:41:37 ascent and a 46:54 descent. I sat behind the summit rock catching my breath for ~20sec before leaving the summit at 1:42:00. On the way down I ran into none other than Andy Anderson (the absolute RT record holder on Longs at 2:02:54, Cables up and down) hiking up the Jim Grove trail w/ another climbing ranger, and I stopped and chatted for 90sec-2min or so with him mostly because I didn't feel like I was actually on that quick of a descent pace (the wind had been throwing me around a lot whilst descending to and then crossing the Boulder Field); I really got after it, though, below treeline again (only a few navigational mistakes) and was really surprised to see my high-46min descent. 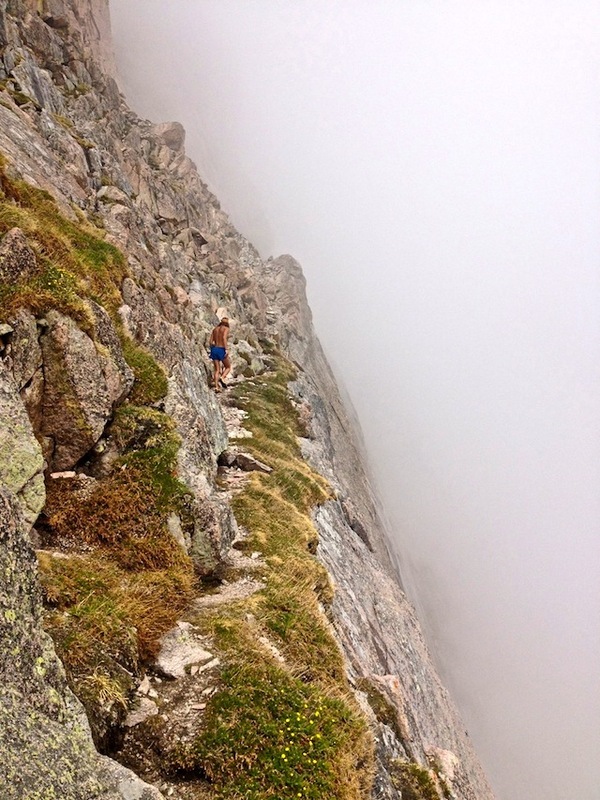 Just w/o the stop to chat, I think I would've been approaching Andy's 44min descent from his record run. Of course, I batmanned down the still-there fixed rope on the Cables, which I imagine more than makes up for the ~2min I spent talking with Andy. I also lost a couple minutes by absent-mindedly climbing too high on the Lambs Slide ridge before traversing the snow over to Broadway. This put me at a wider part of Lambs Slide and also meant I didn't get to use the steps I'd kicked yesterday, as I'd planned. I should've just dropped back down the ridge 100ft or so, but was stubborn about not losing any elevation, and I think it cost me as I got into some pretty slow icy snow and actually climbed up to the rocks for handholds before dropping back down to the Broadway entry. Other than that, I look forward to coming back with fresh legs and a more calm day. Also, getting the trail dialed in just below treeline and between the summit and the top of the Cables will yield another minute or two for sure. Overall, I was proud of the effort, but I know it isn't my best, nor most focused, so I guess I'll be having to go back in the future. 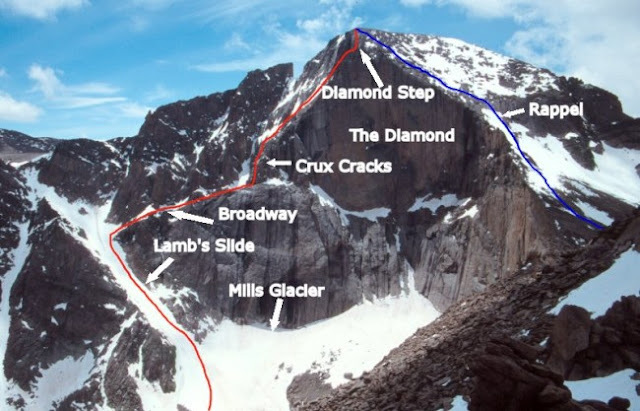 Also, as per the above-mentioned run-in with Andy Anderson, I've become quite interested in the absolute roundtrip record on Longs (generally speaking, the shortest/fastest route involves ascending and descending the North Face slabs). Currently at 2:02:54, sub-2hr seems like a worthwhile goal. In the meantime, I really look forward to continuing to deepen my relationship with this profoundly beautiful slice of Colorado. Up and down NW ridge, with an extra 15min of warm-up. On the descent I punched through some snow and gashed my shin to the gleaming white bone on some talus underneath. Clean-up back at the Roost revealed a likely need for some stitches, but things seem to be healing up fine. Up the West face trail from Winfield. Descended the East face via a fun scree chute/boulder field before finding a surprisingly nice use trail that switchbacked down to Clohesy Lake. 1:49 from Winfield to Clohesy Lake (1:17 at summit). Ran back to Winfield via Rockdale. More Nolan's 14 scouting. Really fun day in the mountains. Started at the Leadville Fish Hatchery with Gavin, headed up the Highline Trail for 40min before cutting cross-country directly up the East ridge to the summit. Hit the top at 1:43. Descended the SW slopes trail down to cross Halfmoon Creek on FS Rd 110J (2:27) before continuing up the road and up Elbert's West ridge to the summit at 3:49. Descended over Bull Hill from there to the Golden Fleece Mine and Echo Canyon, getting to Highway 82 at 4:50. Ascended standard NW ridge of La Plata in 1:39 from the highway (6:45 total on the summit) before descending La Plata's South ridge and getting to the Winfield campground at 7:38 total. Really strong on the first two peaks, but I bonked like a champ above treeline on La Plata (not enough gels). Felt great on the LP downhill, though more than nine gels for the run would've been ideal. The enormity of the Nolan's 14 project is humbling. Parked at ~10,500' on the approach road to the summer TH and ran from there. 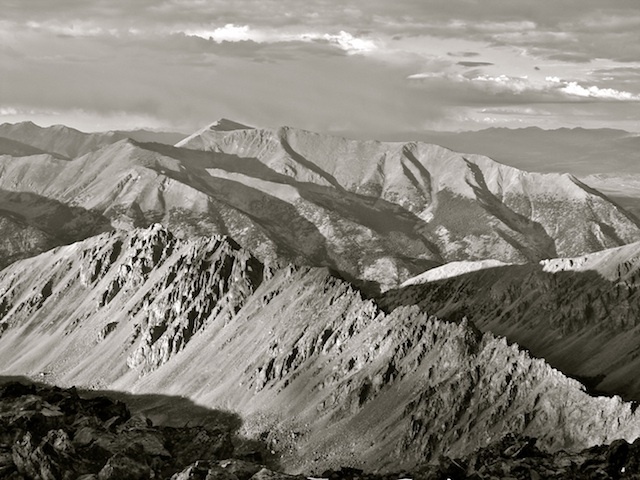 Took the Kelso Ridge up Torreys. Really tired this morning after yesterday's long effort, but it was still great to get in a couple of peaks before making it down to Boulder by 9:30am for meetings with Ultimate Direction and New Balance. Started from the East TH and took the standard Keyhole route to the summit and back. Went up the mountain in 1:41:58, spent 30min on the summit, then descended in 1:02:54. 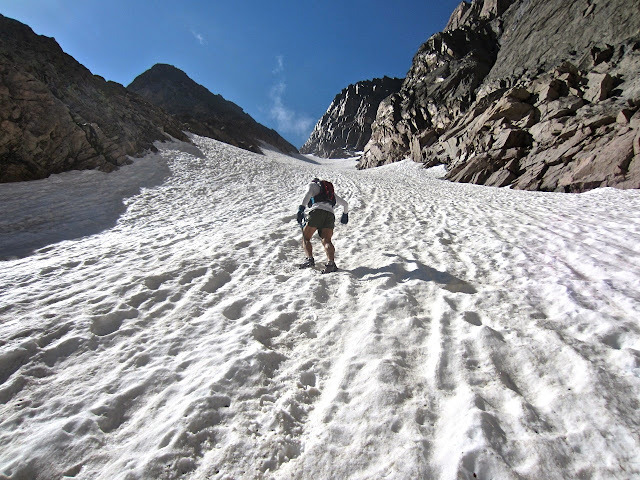 There was quite a bit of frozen snow still in the Trough, so I lost a lot of time there--especially on the descent--but I ran really hard below the Boulderfield on the descent. Stopped a couple of times to take some pictures when I was descending back through the Boulderfield---would've gone sub-1hr for sure on the way down if I hadn't done that, even with the ice-induced pussyfooting in the Trough. Sat-AM: 0:31 ~ All-day photo shoot with NB. Sun-up to sundown. 4am wake-up call. Sun-AM: More photo shooting with NB, but no running. Another solid week in the high country, but I definitely needed the rest that the weekend's NB activities necessitated. The pounding downhill on Friday might've been a touch more than the shin was ready for, so it was good to take a couple days easy. Still having such a blast tagging a different peak every day. 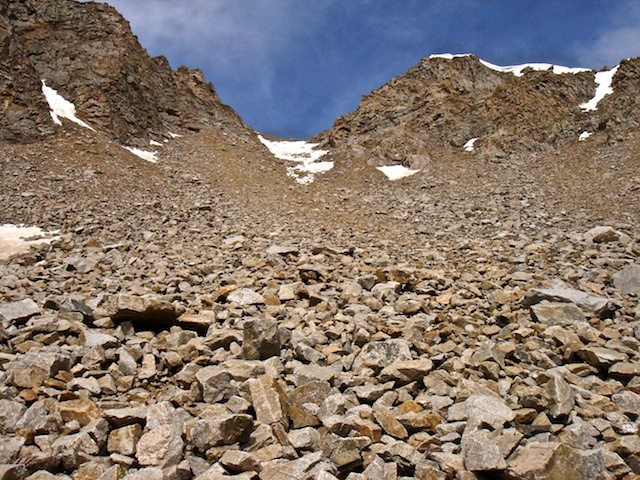 Looking back up at the scree and talus descent from Huron's northern saddle. From the Halfmoon Creek Trailhead with Joe. 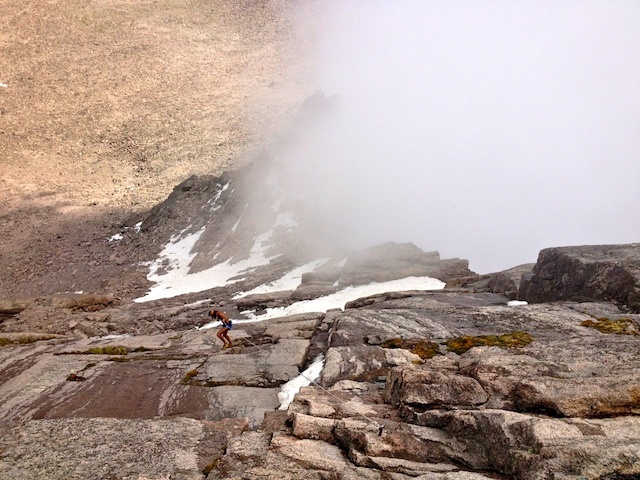 Ran up the CT before ascending the east face of Massive in quite blustery, windy conditions. A bit frigid on the summit. Descended the SW slopes trail before completing the ~14mi loop with a section of FS road. Up and down NW Ridge w/ Joe. 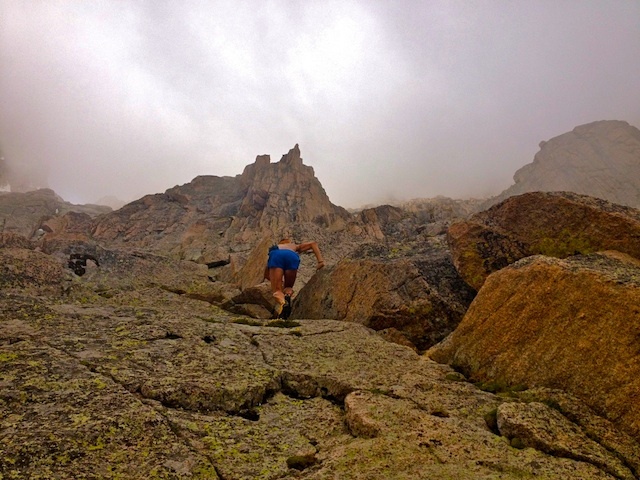 Stubbornly stuck to a running cadence until hitting a small snowfield at 12,700' or so. After some more jogging through the boulder field I was able to beeline it to the summit via some more frozen snow. Wanted to sneak under 1h20 for the climb, but missed it by 25 seconds. Perfect day on top with abundant sun and no wind. 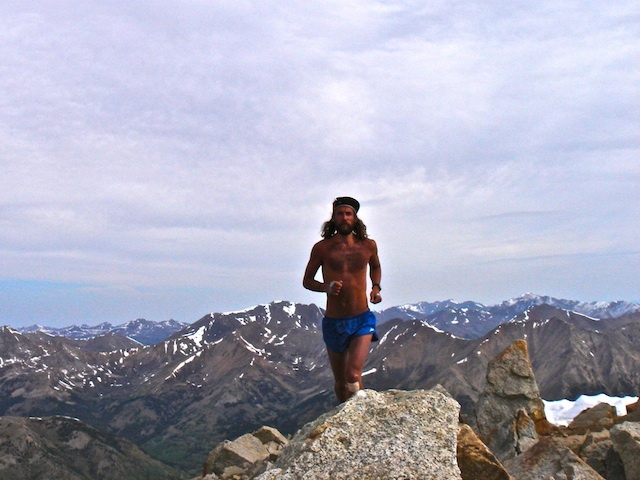 Ran from Bakerville, 33min to the TH, 1:31 Torreys summit, 1:45 Grays summit, 2:14 back at the TH. I was expecting the Kelso Ridge to be much more technical than it was; it's rated Class 3 but it felt like there were maybe two or three Class 3 moves on the whole thing, otherwise it was just hiking. Extra 500' of vert with all the bumps on the ridge, though. Really windy on both summits (and the ridge), otherwise my plan had been to tag Mt. Edwards and the McClellan-Ganley ridge on the way back. Another day. Up and down NE ridge. Just eased into the hill, planning on taking it easy, so was really surprised when I had a 45sec PR at the summit, especially with no warm-up. 1:53 round-trip, but jogged a couple extra miles on Halfmoon Rd to round out the time. Started from Rockdale with Homie, JV, and Joe for a little Nolan's scouting. 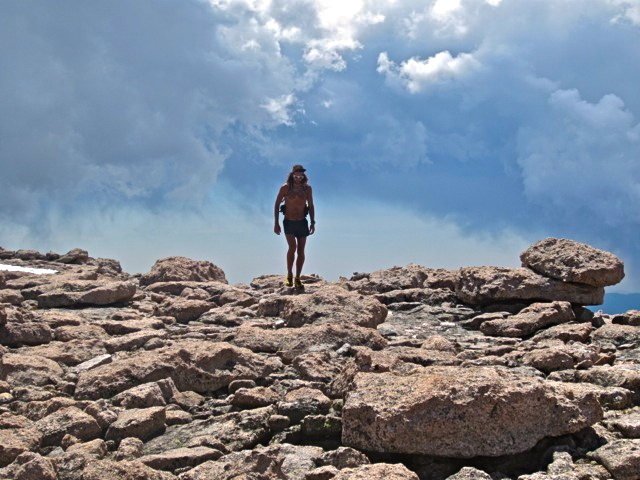 Hit Clohesy Lake at :34, summit of Missouri at 1:29, Elkhead Pass in 1:53, Belford at 2:11, Oxford at 2:31, Pine Creek at 3:00, Harvard in 4:00, and Columbia at 4:56. The looong descent down Frenchman Creek was nice except for the 20+ minutes of bushwhacking through heinous windfall. I felt really strong all day, all of the uphill hiking and techy downhills left me way less beat up than a 6hr run usually would. Did an out and back to the summit from the Fish Hatchery, running up the Nature Trail to Highline before bushwhacking up to the NE ridge, scouting the Nolan's line. Tired from yesterday, 1:46 to the summit. Some extra vert from all the bumps on the ridge. This climb is a rough way to start the entire Nolan's link-up. Or maybe I was just tired. Up and down the NE ridge, pretty tired. 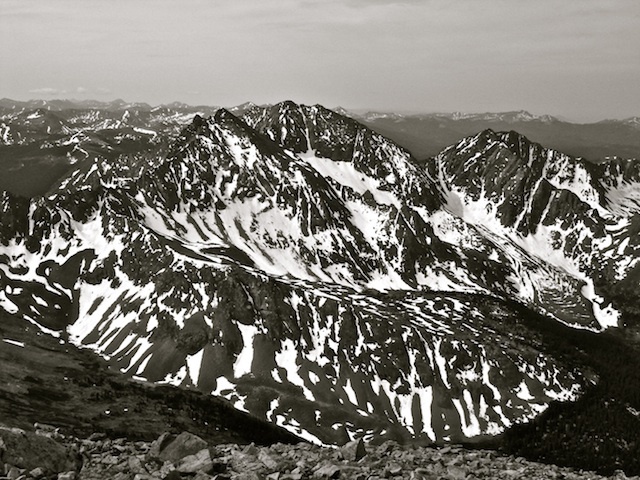 Forgot it was the weekend, but was reminded by the hordes of hikers on the trail, seeking Colorado's highest point. Well, I guess I'm back. Wow. Nothing like some thin air, some patches of ceramic and some French voodoo to set things right. I would rank this up there with one of my best weeks of training ever, definitely from a mountain standpoint. Thursday's PR on Elbert forced me to accept the fact that all of my hiking over the past nine months actually did some good for keeping me relatively physically fit, not just mentally sane. 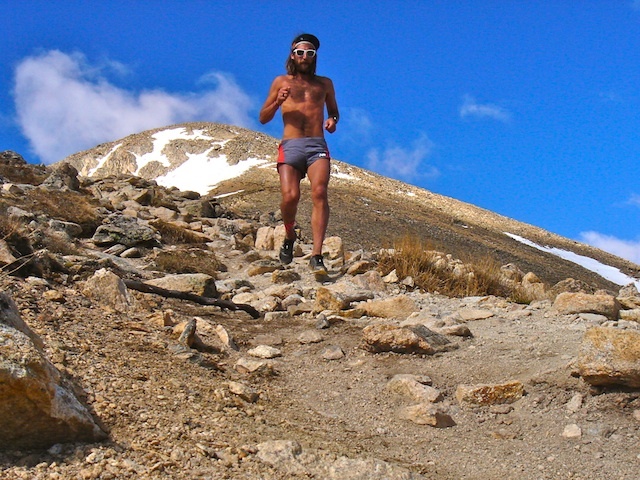 There's still plenty of time for things to go sideways--I've only had two weeks of pain-free running on the shin--but if I can string together five more weeks like this I'll feel good about my chances when I line up for Hardrock next month. 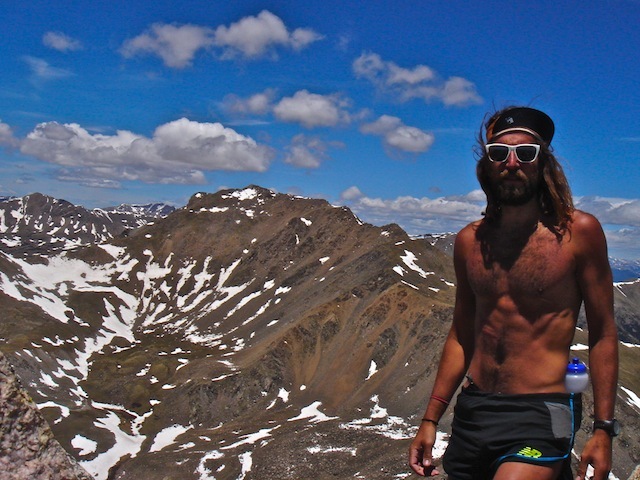 La Plata (14,336') on Tuesday. 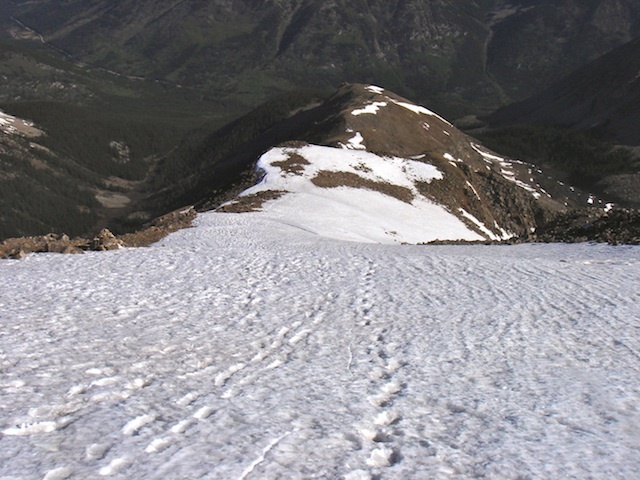 Snowfield descent on La Plata's NW ridge. Descending Mt. Elbert on Thursday. Summit of Columbia, Harvard behind, on Friday. La Plata's Ellingwood Ridge with Elbert behind. Excited to tackle this line soon.